Although EU citizenship may appear to be a straightforward and unproblematic matter – each citizen of a Member State is a citizen of the Union – there are in fact situations in which EU citizenship status can become a thorny issue, at times even determining the outcome of a case. Because the rights automatically recognized with nationality most clearly involve the fundamental right of moving and residing freely, the case law relating freedom of movement with EU citizenship status is extensive and reaches into many areas of practice at every level. the condition of family members of EU citizens. An appendix gathers legislative documents most often cited in the case law. Closely examining the various institutions concerned, case law (Member State as well as Court of Justice), and legislative innovations, the author concentrates on identifying and overcoming those obstacles that still prevent full enjoyment of EU citizenship rights. 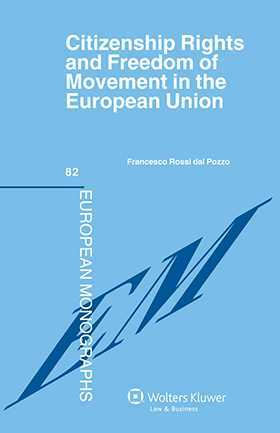 While the clear demarcation of issues will be of especial practical value in anti-discrimination cases, legal academics and jurists will appreciate the book’s signal new contribution to a classic theme of the European Union. I. Citizenship of the European Union. III. EU Citizens’ Freedom of Movement and Right to Reside. IV. Freedom of Movement and Migrant Workers. V. Freedom of Movement and the Family Members of EU Citizens.